Stagg Jr is, according to the interweb machine, made from the Buffalo Trace Mashbill #1 (less than 10% rye) and is reportedly between 7-9 years old whereas George T Stagg is reportedly over 15 Years Old. Batch 8, 64.75% ABV, opened Oct 17/2017, gassed after each use, 4/5 full when sample poured on Nov 8, 2017. Finish: long, oaky, and warming, with some tannins making an appearance near the end, like over-steeped black tea, ending on cacao beans and more dark cherries. With water, the fruitiness is pushed back. Caramel pops out of the glass on the nose alongside a freshly-shucked corn note. With a bit of time, the nose becomes much oakier and an aroma of fresh pipe tobacco emerges. On the palate and finish, there is far less fruitiness with water added. It’s replaced by rich, sticky toffee and floral vanilla, while the chocolate on the finish becomes more like milk chocolate.This is terrific both ways. I like it so much that I asked my local KGBO to bring one in for me. I’d love to meet its daddy. You've inspired me to revisit my bottle. Definitely good stuff. I have the 131.9 proof (last fall's release). I get a bunch of red apple skins, vanilla and cinnamon. So, baked red apple pie. I would enjoy comparing some of the earlier releases. I'm having this back to back with Jack Daniels SB BP. Very different profiles! I like the JD slightly better, which is surprising to me because I've never been a JD fan. Not that this isn't a great whiskey, but that JD barrel proof is something else! Stagg Jr. Fall 2017 Release Bottle: L1727 I was lucky enough to grab a bottle of this. The store was allocated four bottles this year and Sal the manager was kind enough to offer me one. Bottle is 90% full and has been opened since January 3rd. Nose undiluted: Grapey. Red grapes. Baked apples with cinnamon and butter. Banana bread. German chocolate cake. Not really any caramel or nutty notes that I find typical in bourbon. Palate undiluted: Red apples. And more red apples. Lots of red apple. A bit one dimensional with the red apple bit it packs tons of sweet red apple flavour with each sip. Its a good thing I like apples. Finish: Cinnamon, brown sugar. And this darn baby vomit at the very end that I've had twice now. With this and the barrel strength FRSB. Its like the wood got wet and started rotting during the aging process. Arg. Nose w/water: Lots of red fruits and berries and baked apple bread. The banana is gone. Palate w/water: Mmmmm... vanilla pudding, chocolate cream pie, vanilla really becomes prominent with some water. Honey too. Finish w/water: The red apples have now moved to the finish. Thankfully not as much baby vomit at the end. Overall: This is a pack-a-punch big bourbon. Big flavours, lots of baked red fruit and vanilla. Not really much spice. Its a gooey, creamy syrup with plenty of alcohol to go around. The nose is better neat, everything else benefits from a drop of water. So smell it and then add your water. Good stuff. Glad I lucked out this year. @Nozinan I'll try to be patient then. I let this last one sit about ten minutes, I'd like to pour it and forget about it for half an hour or so. Thanks to @Nozinan for this sample! The colour is a medium copper. Thick on the nose with dark cherries, very dark chocolate, musty leather, green apple skins (?) and seriously charred oak. You know that black soap people used to put on their faces? That's kinda there too. Dark, dried up ketchup (weird, I know, but I got that!). Water adds complexity, with banana skins and crayon wax (from where in my brain are these notes coming from??) Extremely rich, as you could imagine. On the palate I get more alcohol than on the nose, with more cherries, a lighter dark chocolate, cinnamon, Demerara and tannins. A lot punchier with water. A real knockout! Which is weird since calling something "Jr." implies it is not quite as bold and strong as the "Sr." Maybe they should instead call it "Weird Awkward Uncle Stagg Who's Always Lived Alone, Wears Camo And Watches Too Much Walking Dead." @talexander Even with a 91 rating, it soumds a little bit too weird for me. Seriously, I loved GTS and should like the junior as well. Thank you for a fun review. I’m desperately trying to close out 2016 on a positive note. Personally as well as from a whisky review perspective. Of late it seems all I’ve been doing is getting angry at whiskies and their masters for letting me down. Some have in mildly irritating ways and others in much more spectacular fashion. But the general aim this year has been to upset me and, along with fattening the books, they seem to have met their target. But I won’t let them drag me down to their level. No, thank you. So while I do have some scathing reviews tucked away they’ll be better suited to the dawn of a new year. My objective now is to comment only on whiskies that make me happy until this dreaded year is finally over. I look forward to an interesting ten days. And that brings me to the Stagg Jr.
For those who know me know that I am in love with the senior. It changed my perspective on how I perceived bourbons especially ones that came close to spontaneously combusting thanks to inhuman levels of alcohol strength. I’m talking 70%+ here ladies and gentlemen. To achieve a bouquet of flavours and balance in a beast that strong is almost an unfathomable work of art. And that’s precisely what the Antique Collection is. A work of art. The Stagg Jr comes from the same pedigree as the senior. Introduced back in 2013 as a younger alternative to the George T Stagg it uses a blend of whiskies 8 or 9 years old and the same mash bill – Mashbill #1. The recipe is pretty much a secret and all we know is that #1 uses less than 10% rye in the overall mix. As for the remaining grains I’m sure there’s a large percentage of corn and then some wheat. There could be some barley too. But I’m not certain. Panned by critics when it first came out it was considered an unworthy alternative to the George. However, later batches saw the same set of non-believers warm up to this rather tasty barrel proof bourbon. I have sat in my glass Batch 5, recognisable by the proof hastily scribbled on the label. Mine sits at a wonderful 129.7 which, in layman’s terms, is around 64.85% ABV. My sample is from a half empty bottle opened just a week ago. Nose: That familiar sweetness. Instantly took me to the George. Peppers. Black berries. Milk chocolate. Dark chocolate. Chocolate milkshake. Did I mention chocolate? Touch of black liquorice. Brown curry powder. In a good way! Burnt caramel marchiato. Breakfast toast. Ripe watermelon. Watermelon? Seriously? Quite drying with a ton of cooking spices on a dry forest fire. What’s not to like? Palate: As you would expect. A nuclear explosion of pinpricks brought under control by a dark chocolate. Like a Lindt red chilly. Cherries. That smoke from that fire. Milk chocolate. Quite tannic. Dries mid-palate. The oak is quite pronounced. As are the spices. Not as sweet as I expected it to be. A hint of maple syrup. Feels youngish for some reason. But I love the strength. Finish: Long. Long. Long. Oaky. And oily at the same time. Barbecue rub. Overall Comments: First up let’s consider what is on offer here. A solid whisky made from the same recipe as the George. A touch younger, yes, but when you compare the price point it’s a no brainer. Pick this up for no more than US$60-70 (the later batches, of course) instead of mortgaging your children for the George T Stagg – that is, IF YOU CAN FIND IT! Sure, it’s a little rough around the edges but aren’t we all? In fact that’s what makes us so endearing, doesn’t it? Hello Gentlemen! @MaltActivist, @Nock, @paddockjudge, @Nozinan, four of my favourite people "all in one place" cyber-speakingly. I'd like to get the four of you together with us for a tasting one day. About those three Bourbon products, 15 yo George T. Stagg, Elijah Craig 12 yo Barrel Proof, and 8 to 9 yo Stagg Jr....the WOOD is the differentiator. Remember this, George T. Stagg is George T. Stagg because the barrels of whisky going into it continue to mellow and get better all the way up to 15 years (and more) of aging. Very few new oak barrels are good enough to succeed in aging to make a great whiskey at 15 years. If the wood barrels are NOT GOOD ENOUGH to allow the whisky to progress in a good direction for that long number of years then they are dumped for standard Buffalo Trace bourbon or for Stagg Jr bourbon. This is not to suggest that Buffalo Trace and Stagg Jr. cannot be very delicious products, only that they are products reflecting the "sell by"/"bottle by" dates of those particular barrels, based upon the quality of the individual barrels. Similarly, if the barrels used for Elijah Craig 12 yo Barrel Proof were "better" = more able to do so, they would most likely not be used for Elijah Craig 12 yo BP, but would instead become Elijah Craig 18 yo, or another premium Heaven Hill long-aged product. I greatly love both George T. Stagg and Elijah Craig Barrel Proof, and have found at least one batch of Stagg Jr that I like a lot, from a sample given to me by @Nock. I am still wary of Stagg Jr. from that first batch offered (and I still have a bottle of that one). I continue to think that Buffalo Trace blew it by bottling that first batch of Stagg Jr. after the wood had become too tannic and bitter. @Nozinan, you would have been appalled to have heard the HOWLS of hatred and disgust from four or five of our mutual Toronto friends when I served them samples of that first batch of Stagg Jr. They hated it. They hated it more than I did. In truth, my review score of 85 did not reflect hatred, but instead severe disappointment, in a whiskey which should have been good enough to score 90-93 points. But the bottom line is that I will be happy to drink any and all three of these bourbons with any or all of you gentlemen when the opportunity arises. Yes, I agree with both comments - that all three are different, and that all three are similar. I remember in my early days of bourbon drinking I was able to acquire a bottle of George T. Stagg fall 2005 release (for only $50 at the time). And my thought was, "this is fantastic; I want to drink more stuff like this." When I first joined Connosr (back in 2010 or 2011 I think it was?) I remember asking the venerable bourbon expert @Victor what in the bourbon world was "similar" to George T. Stagg. I was having a much more difficult time finding it in those days (go figure). I remember his laugh at my ignorance. His only comment was, "Nothing." Today, I happily consider both Elijah Craig Barrel Proof and Stagg Jr. to be worthy alternatives to the venerable Stagg senior. Yes, neither are quite to the level. But I consider it two A-'s to the A/A+ that is George T. Stagg. Not quite, but close enough. I am grateful that both ECBP and SJr. can still be had for around $50 - when you can find them! Anyway, back to the review: Thanks again! I recently saw this available at the LCBO, then it wasn't again. Looking to see if I had missed the BTAC lottery I typed in STAGG and this came up. In one store in Toronto. I was not far from them yesterday so I called and of the 26 listed (in the 30s the day before) there were 22 left. I picked up 2 for me and one for a friend. This morning the store had only 11 listed, and 2 other stores had a handful. I was not in the mood to drink yesterday (work-related stress), but today I felt a bit better and I decided to try something new in the way of reviews. I will review this first pour, and revisit the smell and taste as the bottle evolves, reporting back. I've revisited reviews before, but never from the first opening. Unlike most bourbon reviews, I did add water, and will comment after my review of the neat product. After adding a half capful of water to a 20 cc pour, the alcohol recedes in the nose and on the palate, and it's a little less hot. Another half capful lowers the flames a bit more. Still nippy, and still full of flavour, but a little easier to drink. I'm stopping at 2 capfuls. It will be interesting to see how this develops. I'm also hoping to share it with some Connosrs next week and see both what they think of it and how the taste changes when I drink it with good company. Managed to snag a couple of bottles and opened my first one just a couple of days ago. While the Senior it is not the Stagg Jr is a fantastic bourbon with enormous value (I got it for around US$55 if I remember correctly). Solid whisky. Maybe a touch heavy on the oak but I'm not complaining. Balance: good but not great balance here. This batch of Stagg Jr. is still not in the same league with George T. Stagg, but I don't think that this batch would elicit groans from some of my Connosr friends (in Toronto), as did the first batch of Stagg Jr., when I served it to them. In my review of the first batch of Stagg Jr. I said that I saw no reason why Stagg Jr. couldn't and shouldn't be much better whiskey in later batches. The process of improvement is already underway. I place a high value on intensity of flavours. If I did not, this batch of Stagg Jr. would probably rate 84-86 from me, rather than 88. (and the first batch would have rated 81 from me) Thanks again, @Nock, for giving me this sample which restores my faith in Stagg Jr.
@Benancio, it has gotten pretty ridiculous trying to get premium bourbons and ryes the last couple of years. You do what you can to find them. You have a few good ones now...it looks like you are mostly the Big Flavours whiskey lover. In the right circles you might be able to swap that Pappy Van Winkle 20 yo for two or three bottles of Buffalo Trace Antique Collection Whiskeys, if it were unopened. I have a bottle of Col E H Taylor Barrel Proof coming to me soon. I have heard only very good things about it. Good to hear that you like it a lot. @Robert99, you are really making me laugh! Love the UFO comparison! It is kind of like that if you want something, and it is just not anywhere around to be found. Around here Karuizawa is in that category, hell, Nikka From the Barrel is in that category here, as are Aberlour 10, Glenfarclas 15, Talisker 57 Degrees North, and The Bailie Nicol Jarvie. US Whiskeys? Yes, those too: Four Roses Limited Editions are slim and none...and BTAC whiskeys and Van Winkle have gone from 'slim' to 'almost none'. So I snagged a bottle of this when it barely came out only to watch it take a battering by the critics. Defiant as I am, I though, "What do those old hacks know anyways." Well those old hacks seems to make much sense now that I've tried this Bourbon. Nose: There is nothing more annoying on a whisky than too much alcohol wafting up from the glass and there is too much here. So instead of waiting I cut it down with some water. I got hints of cotton candy, rum raisins, rum wood, pepper mint, and vanilla. Taste: I get the cotton candy, pepper mint, and the vanilla. Wow....the spice is ridiculous and insufferable!! Even with water this is really hot!!!! Like scalding hot water. Very harsh. I can't get much flavor out of it with this kind of brute force power on display. Finish: Harsh alcohol, dry, cotton candy. I'm all for power in controlled measures but this Bourbon is out of control. I let my gf have a sip of this and she was left teary eyed and gasping for air. I myself needed a touch of courage and some water to finish this one. Try this and attempt to keep a straight face. I was lucky enough to pick this up on my last trip to Myrtle Beach on August 9th. I opened it almost immediately. It has taken a beating by critics. And yet getting your hands on a bottle is just as difficult as getting your hands on George T. Stagg. Now, I am unashamedly a fan of big barrel proof whisky. George T. Stagg is without question my favorite bourbon (that I have had the pleasure to own – I have tasted a Willett that makes me wonder . . .). So I come to this biased. I want to like it. Here are my thoughts after three “official” tasting session with pen in hand. Nose: Leather, tobacco and alcohol! Candy canes and red hots. I love this nose. Rich wood flavors mix with sweet brown sugar. More alcohol and simply more “bourbony” then the Elijah Craig Barrel Proof, and it goes without saying it is more muscled and austere. This is way more about power: raw bourbon power. It certainly reminds me of Stagg. Less sour then ECBP, but then it is also less sweet. This is a deep one: it is like approaching the earth’s core. After a little time I am finally dialing into the right frequency: bourbon hell fire, volcano lava, and charcoal. There is brown sugar here, but it is far in the background. With time the brown sugar moves to the fore. It is a nose that grows on you. There is something new and intense every time I nose this. My only complaint is that it doesn’t have the utter depth and richness that the big Stagg Sr. (and to an extent the EC) has. Water only brings out the intensity. Taste: More balanced then ECBP. Nice balance of sweet and wood oak. Feels great in the mouth as it destroys your mouth. Finish: Huge wash of bourbon . . . leather, brown sugar, charred wood, charcoal, out door BBQ, smoked meat . . . this is a huge finish. It is lasting for an age . . . and the salt pulls out every bit of moisture from your mouth. This is decimating! This is way more power then the EC has. And it lasts much longer. Balance, Complexity: While it misses the depth of complexity that the ECBP has it is still extremely complex in a way I like. The balance is also wonderful: the sweet and the sour really balance out nicely. And the power . . . my goodness. This is Thor to the George T. Stagg’s Odin. Aesthetic experience: It is a smaller more squat version of the tall slender Stagg bottle. I don’t love the “hand written” label because it is much more fake then the standard Stagg. And I don’t like that they are tying to make it look darker with the back label. Still, a 9yo at 67.2% . . . I love the idea of a younger Stagg. Conclusion: I really, really like this bourbon. I do think that @Victor is correct – they should have called it Buffalo Trace Barrel Proof. But they wanted to capitalize on the Stagg name. I get it. I have a hard time faulting them when Stagg Sr. is the same juice just older and more carefully selected. Will I buy another bottle? Absolutely. Is it worth it at $49.99 a bottle? Absolutely. Is it as good as Stagg Sr.? No. But I find it does what only Stagg Sr. can do – it blows my socks off with power. That is a very interesting observation. Someone could easily read my review and dismiss it saying, "Well, @Nock just wanted to like this whisky - so he did. It is classic wish fulfillment" However, both of us were biased to like this whisky (would you agree?). We both wanted to like it. I end up liking it a great deal. You did not. Very intersting . . . While I very happy to be in the "Big Flavors Club" with you I know we are not always going to agree. I realize I have a much for focused range of "likes" then you. I might never warm up to Tequila. But I deeply have appreciated your help on the journey of flavor discovery. @Nock, thank you for an eloquent review posted with an obvious love of the whiskey reviewed. Yes, unquestionably Stagg Jr is an extremely powerful whiskey experience. I just wish that I could enjoy the taste of it as much as you do. I would like to. I just don't. Not the first batch, anyway. But in the whiskey business there is always another batch on the way. 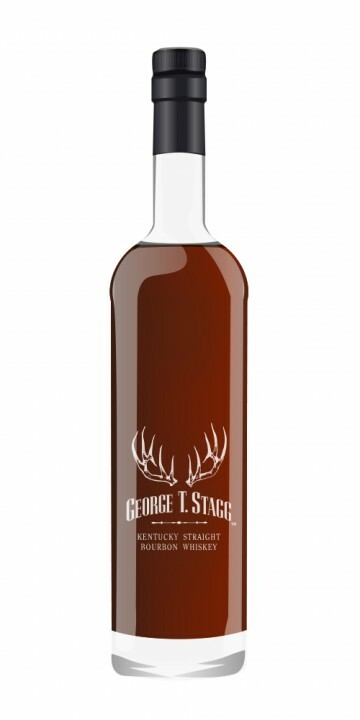 Stagg Jr is from Buffalo Trace Mash Bill #1, the grain recipe for both standard Buffalo Trace bourbon, and also for the 15+ years aged George T Stagg. Stagg Jr is a bit of a misnomer for Buffalo Trace Sr. Stagg Jr is nothing like George T Stagg and very much like a more concentrated form of Buffalo Trace Bourbon. Buffalo Trace Mash Bill # 1 is very high in corn and contains only about 8% rye grain, which is about the lowest rye content of any bourbon on the market. George T Stagg features as its most outstanding feature multiple layers of very complex wood flavours, which are all the more easily tasted because there isn't much rye present to seize the attention. Standard Buffalo Trace Bourbon is one of the VERY few bourbons I have tasted (and I've tasted maybe 150)in which corn is actually tastable. Usually rye and new wood obliterate the ability to taste corn in a standard, i.e. rye-containing, bourbon. At least to my palate they do. The Stagg Jr is 8 to 9 years aged, and the glorious wood flavours of George T Stagg are not present. Stagg Jr is really just uncut (undiluted) Buffalo Trace Bourbon aged 2 or 3 more years. @Nock, your bottle of Stagg Jr was in my tasting of it much sweeter in the nose and early palate than was my bottle when first opened. Mine became sweeter in the nose and early palate and very similar to yours after the bottle was open for more than 12 days. Bourbon really is all about a balance of sweet and sour, with most of the sour component being from the tartness of the alcohol. There is no salty in bourbon and there is no bitter ever present in bourbon, unless the oak is bitter or old and overdone. I certainly understand that not everybody likes a balance of sweet and tart/sour. Not everyone likes bourbon. I will be fascinated to see whether, when Buffalo Trace puts out a batch of Stagg Jr which tastes more like a normal bourbon with good wood, whether you, @Nock and @Whiskybee, will like it less than you like this first batch. Thanks for the honest review. I also fall into that "mostly-malt-drinker" category. I certainly don't like the main stream bourbon taste. It tends to run a too sweet for me (and often to sour as well). I think I am more turned off by sour then bitter (I do love coffee). My memory is foggy . . . do you recall that my bottle was a little sweeter then yours? Or was it not as bitter? Or was it only very slightly different? @WhiskyBee I really loved my bottle. I'll try and post my review here soon. But first, I will pour myself another dram with @Victor's notes in my ear. I want to see if I can pick up on that bitterness he is talking about. Here’s the new Stagg offspring, as reviewed by someone who’s not yet acquainted with the family patriarch. I’ve had a few chances to pick up a bottle of George T. Stagg, but I refuse to pay the mercenary prices (about $250) at the local store when they receive their supply of one or two bottles per year. The waiting list for a Stagg at Binny’s is such that I’ll probably be on a diet of Ensure and creamed corn by the time my name comes up. But I continue to be patient, with the confidence that the right price and moment will come along some day. Word is that Stagg, Jr. will be released in small batches on a regular basis, and that each batch will be aged eight or nine years. No batch information on my bottle (unless it’s on the inside of the back label, in which case I’ll have to wait until the level goes down before I can read it.) Unlike the promotional pictures you’ll see, in which the whiskey appears to be almost orange in color, the real-life article is a deep mahogany brown. So with no basis for comparing Sonny Boy to the Old Man, I’m rather impressed with Stagg Jr. It’s not perfect, and it’s more fiery than complex, but I’ll be buying another bottle once I’ve drained this one. Some early reviews have emphasized junior’s heat and urge adding water. I suggest the same, although I don’t mind starting a dram with a neat sip or two. But if you want more flavors beyond corn, vanilla, and fire, add some water. For me, it’s been a bit of a challenge to get the amount of water just right. With such a powerful heat punch, it’s surprisingly easy to drown. Experiment with a drop at a time. Nose: Sampled neat, it’s rather mild for such strong stuff. Pretty one-dimensional as well: mostly wood and sticky dark fruits. With just a few drops of water, I get vanilla, cinnamon, loads of wood, and a touch of corn-on-the-cob boiling in the pot. Radical changes with just a little water, in other words. Palate: I tried my first sip neat and it was like a corn roast at the flaming gates of hell (but I enjoyed it!). Then I made the mistake of adding a full teaspoon of water—and with such heat, that amount seemed a reasonable guesstimate—but the result was just watery sweetness with a hint of wood. For my second dram, I added one drop at a time and determined that three drops results in maximum flavor with just the right touch of sting. Cherry hard candy, cinnamon, maple, rye, corn, cloves, and, again, plenty of sweet wood. The same flavors carry on in the finish as more wood and a little mint emerge. I just wish it were a little stronger at the fadeout. In all, Stagg Jr. is a tricky one to pin down. Again, the water issue adds to the confusion. It seems to tame some things that need taming as well as some things that don’t. But it’s as good as or better than any other $50 bourbon in my cabinet, and for that I’m not complaining. I've got a few minor gripes, but I think it's quite delicious nonetheless. Thank you, @WhiskyBee - great review. Everyone I know who has tasted this has had negative things to say, but of course, they are all fans of Stagg - so perhaps the comparison is unfair? Great to hear some notes from someone who is not making comparisons. Stagg may be my #1 favourite bourbon so I am dying to taste Stagg Jr. - and will try my hardest to keep an open mind! @talexander - The majority of online reviews compare it to GTS, and I do think that's unfair. Stagg Sr. is heralded as the Gold Standard of bourbon, so of course Junior is not going to measure up. Forget the name on the label and approach it as you would a $50 bourbon. It's certainly as good or better than anything I've tried in that price range.